We trust that all our units have received invitations, posters and our earlier communication in regard to our conference. We are also confident that preparations are underway from the delegates and observers representing our units to reach Hyderabad. As per the reports nearly 850 comrades from all the states including North east & J&K are getting ready to reach Hyderabad. It is encouraging to note that a major chunk of delegates and observers are from younger ones. Good number of ladies too form part of the contingent. Our Host unit - AP&T unit is working day and night to make all the arrangements to ensure that our comrades coming from different states are received well, provided comfortable stay, delicious food and above all a good ambience in the conference venue etc. There again major part of the responsibilities have been undertaken by enthusiastic young comrades under the able leadership and guidance of Com. Rambabu, Com. Prakash Rao and Com. Jagdeesh Babu. Given all these, we are overwhelmed and are confident that the Success of the conference is already written on the wall. We have experience in the past - every other conference had beaten the record of the previous one. We have no doubt that this 15th Conference too will beat the record of the previous one and set a new record both in terms of arrangements and in terms of quality of discussions and decisions. Let us together make it so. It is to our Honour & benefit Com. Sudhakar Reddy, General Secretary of Communist Party of India, an intimate friend of our movement will Inaugurate the Conference at a time when the entire working class has decided to close ranks and launch a movement against anti labour policies of the Government. Our MD & CEO Shri R. K. Takkar will address the Conference as our Chief Guest, at a time when all of us -Ucoites- are anxious and are concerned about the future of our Bank. Our Executive Directors too have agreed to come and grace the occasion. At a time when we are eager to know what shape the current negotiations on the 11th Bipartite Wage talks would take shape and at a time when we are called upon to be in a state of preparedness to intensify our fight against the policies of the Government -particularly move towards Privatization and consolidation, Com. C. H. Venkatachalam, General Secretary of AIBEA will be with us and deliver the key note address. President of AIBEA Rajan Nagar will be inaugurating our Delegate session. 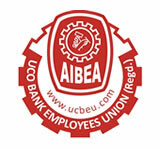 Besides, Leaders of fraternal unions including Leaders of our officers movement under the banner of AIBEA will greet the conference. Thus meeting at this crucial time, when the Industry, particularly the Public Sector Banks, more specifically our own Bank are passing through turbulent times & at a time when the entire work force in the industry, at the call of UFBU is gearing itself to intensify the struggle both against the Banking reforms and for realization of our demands 15th Triennial conference is going to assume lot of importance. Thus there is more responsibility upon us to make the Conference a meaningful one. While on this, we request the units to take note and be guided accordingly as under. 2. Transport is available for transporting comrades from station / airport to places of stay and at request on the days of departure. For commuting from places of stay to the venue of the conference on all days, the units or individual comrades will make their own arrangements without depending on the host unit. 3. Units should advise the host unit about their arrival and departure to enable them to make arrangements for receiving them properly. 4. Units/ individuals who will be over staying - before 10th and after 13th morning will have to bear the cost of stay. 5. In places of stay, only bed tea is arranged. All other services will be at the cost of units / individuals. All food arrangements are in the main venue of the conference. 6. Advise all participants to be with the badge all time during the conference. 9.30 AM. How to make hassle-free claim on Medical bills - Presentation by . TPA -Heritage Health Pvt Ltd.
On all the three days there will be no TEA BREAK, but Tea & Snacks will be served outside the venue from morning to night. All the above are to be noted and units should advise their delegates and observers to adhere to the timing strictly and cooperate with us for maintaining the schedule and ensure smooth conduct of the conference. Secretariat, at the Venue of the conference will start functioning from 9.30 AM to 2 PM on 10th and unit leaders will collect badges, documents and compliments etc., from the secretariat for their delegates & observers. It is to be noted that all dues and details sought by us, must be either sent in advance to HQ or submitted latest at the Venue, before collecting the above materials. We are confident that as in the past true to our tradition everyone would play his / her due role and contribute to the success of the conference. Eagerly waiting to meet you all, at Hyderabad.